I'm sorry for posting something obscure to non-US cultures. "Hungry Hungry Hippos" is a children's game (for ages 3-6). I think it was at least at one time available in the UK under the simpler name "Hungry Hippos." For more information about the game, here's a link: http://en.wikipedia.org/wiki/Hungry_Hungry_Hippos. I'm fairly certain I had this game when I was very young. I made this joke because Ubuntu releases are named after animals, with an adjective attached, such as: Warty Warthog, Hoary Hedgehog, Breezy Badger, and so on. I thought this might be funny because, for a Linux distribution, Ubuntu seems "hungry" for system resources. As you know, a hippopotamus is an animal found in sub-Saharan Africa. It'd be great if ubuntu crew name next version hungry hippo, but I don't think they will find it so funny. I can't tell if you got the joke and are going along with me or not ... you tricky bastidge! The people at Ubuntu Brainstorm are definitely not happy with my ideas: the one idea I suggested seriously has a current score of -72. I was almost absolutely certain (99.999999999999% certain ) that you knew what a hippo is, but then I wasn't absolutely certain that they were only found in Africa, so I looked up the article in Wikipedia. 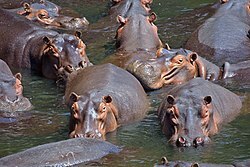 Then I saw the photo of the hippos, and I really liked it, so I posted it. There's a pretty good zoo near where I live, but even there I've only ever seen one hippo at any given time. Anyway, I'm sorry if I insulted you (if I did, it wasn't intentional). Also, I've been waiting for a very long time to use my Ubuntu: Hungry Hippo joke. I know it's not very funny, but for some reason when ever I see some reference to Ubuntu I think of it. Are you kidding (again)? It was great, and I walked right into it! The Headacher: Actually, I was serious; I didn't think other people would find it that funny. I'm glad you found it amusing. Apparently some of the Ubuntu folks didn't like it, though, judging by the -56 score it has right now. To be fair, I don't know that a lot of other people didn't give it positive votes, but ending up with a net negative. I also don't know that some of the down votes weren't just because people thought it was silly and wanted the serious ideas up on top. Anyway, I'm sorry if I insulted you (if I did, it wasn't intentional). Don't think so much buddy I sensed nothing negative in your posts (till now in this forum). You are like a humble poster Nice work on those Hippos though! I also loved the math joke, but that one I am gonna steal whether you like it or not. And there is not a thing you can do about it. But we all know it was Tom's, and not mine. "I was told there would be no math in this exam" Classic! it's gonna be in my share. In exactly the right context that one is dynamite! Freston: Of course you can use the Hungry Hippo joke. You can even attribute it to me if you want, or not, it doesn't really matter. However, if the Ubuntu people show up and set fire to my house, it's on your head. I think I first saw the math thing on Saturday Night Live, and it had to be around 1975 or so. It was actor Chevy Chase as (then-) US President Gerald Ford (now deceased - Ford, not Chase). It was something about the president in the Oval Office sitting at his desk saying, "I was told there would be no math." Also there was the line, "I was told there would be no math on this exam," in the mid-1990s movie Reality Bites.